Quanta Cloud Technology servers are innovation and advanced technology at its best. Never locked into specific parts or software due to the standard and open hardware. Fast, reliable quality products with compatible rack integration and optimized performance by flexible product configuration. S3S's QCT Servers are state-of-the-art equipment, cost-effective, bring fast-deployment, easy replacement and maintenance. 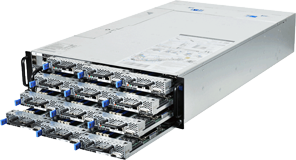 The QCT Servers are greener and more powerful with extreme memory capacity and flexible, scalable I/O options. You also have high storage flexibility and ultra low latency NVMe solutions. The QCT Cluster Servers have enhanced I/O scalability and flexibility with On-The-Fly-Cache Synchronization. The shared infrastructure design delivers energy & cooling efficiency. Ultra-Dense design with High Computing and Low Energy Draw, Great performance possibilities with NVMe SSD support and various OCP Network options. QCT Servers are fully customisable and very powerful innovative solutions for your datacenter. For complex configuration we recommend contacting our expert.